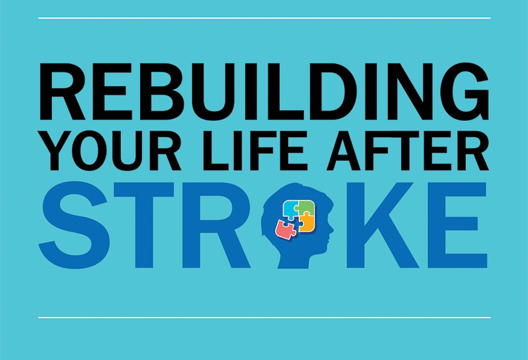 Along with Malin Falck, Tasmin Miles, Julie Wilcox and Sam Fisher-Hicks, Reg Morris has produced Rebuilding Your Life After Stroke: Positive Steps to Wellbeing. We asked him about it. Why did you and your team write the handbook? How would you summarise your approach? The approach is in two stages. The first provides practical advice and simple techniques for managing common psychological problems after stroke, including anxiety, memory loss, pain, and isolation. The second uses acceptance and commitment therapy as the foundation for helping people to manage more persistent and difficult psychological problems, and audio materials and written exercises enable people to practise the self-management techniques. Was it particularly important to feature the voices of stroke survivors? The book was co-produced with a panel of stroke survivors and their carers. They guided us towards what they felt was accessible and helpful to people like them. They also provided tips for managing some of the more frequent psychological problems. The book includes linked videos of interviews with stroke survivors and their carers. The book was launched in June 2017, and the principal platforms for its dissemination, the English Book Prescription Scheme and the Welsh Stroke Services distribution scheme, were only launched at the start of July. So it is early days. However, early responses have been enthusiastic from both professionals and stroke-affected people. What would you like to see next, in terms of research and practice? I would like the book to be adopted and used by primary care services, community-facing stroke services and charities, both as a self-management guide and as a foundation for individual and group therapy. The effectiveness of the book should be fully evaluated; first through qualitative and feasibility studies, and subsequently through a fully funded randomised controlled trial. - Rebuilding Your Life After Stroke: Positive Steps to Wellbeing is published by Jessica Kingsley Publishers.